What I wanted when I sat down to watch The Wolfman was quite simple: some gore, a good (no, great) effect when transitioning, and some gothic imagery. What I got was exactly that – and nothing more. Lawrence Talbot (Del Toro) is a well-known actor in London, currently playing Hamlet to sold out crowds. Lawrence has been estranged from his father for some time; his mother committed suicide and the family didn’t hold up well in the aftermath. After a performance, a beautiful young woman, Gwen (Blunt), interrupts his cast party with terrible news. Lawrence’s brother has been found brutally murdered. Gwen is apparently attractive enough to lure Lawrence back to Talbot Hall where he makes little attempt at reconnecting with his father, John (Hopkins). Lawrence is bent on finding his brother’s killer and begins making rounds through the town. Rumors of an awful creature, a fell beast, are whispered. The gypsies have made a stop in town and with them comes curses and monsters. Lawrence (on a night with a full moon of course) heads to the gypsy camp to investigate and gets mauled by the beast as it attacks the camp. Though the wound should have been fatal, Lawrence is back on his feet in a surprisingly short amount of time. As Lawrence’s fated transformation into a wolf progresses, Scotland Yard sends along Inspector Abberline (Weaving), fresh off the Ripper case, to calm the town’s fears and catch the killer. The rest is details. There is a particularly interesting scene in a mental institution in London, and some chases in between. There is a twist – one I didn’t see coming until the last minute – but not a great twist. There’s a lot of fog and dark images in the forests and empty manse’s. There’s some gore, some arterial spray. Details. Del Toro was an interesting choice to play the lead role, but he does so with obvious admiration for the material. Hopkins relishes the role and is the best part of the movie, with his interesting stares. On the other hand, Blunt and Weaving seem to drift through the script. I cannot say whether it was lack of substance or effort, but neither part is particularly interesting even though they should have been. The movies best moments are, naturally, the grotesque transformation scenes. An American Werewolf In London was instantly famous for it’s cutting edge special effects. Since then, not many werewolf transformations could top it. I believe that Rick Baker and his team have done it, though – the bone crunching VFX are well-done and make you twinge a little in pain. I also asked for gothic imagery and got my fair share of it. The cinematography is well done – not award winning, and it makes a great overuse of post-production effects, but still manages to evoke the right emotions. That is high praise for the cinematographer, who’s last big-screen effort was The House Bunny. I must admit that I enjoyed myself throughout. Yes, it’s mindless, and brought nothing new to the story. But it was fun, violent, and dark. 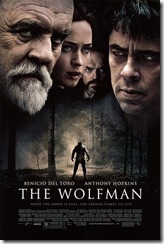 If you like the story of the the Wolfman, then check it out – I don’t think you’ll be disappointed. © 2019 the blog of nathan loding. All rights reserved.